Launchpad couldn't import bug #332078 from GNOME Bug Tracker. The search button in the nautilus toolbar does not toggle the location bar to become the location bar again. notice the folder buttons in the location bar. Notice you cannot return to the folder button view by clicking search again. This is in the Browser Nautilus mode. As a workaround, you may hit the Esc key to return to the location bar. Actually, the ESC key doesn't work on browser mode with "folder buttons path", you have to change folder to make the search box disappear. which was marked as duplicate to this bug. I agree that the behavior of the search button is unintuitive. There is no clear way to return to the state before you clicked the search button. The search should either open in a new tab by default or the search button should also remove the search interface and restore you to the directory you were currently browsing. 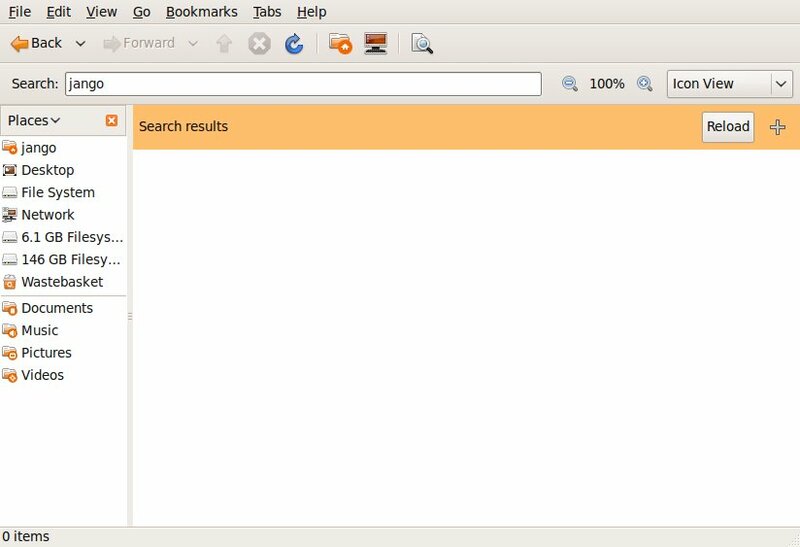 It isn't logical that the search should replace the current directory unless it is operating on the current directory in some way, and in Ubuntu I believe this isn't the default behavior (ie the search takes place at Home regardless of the current folder, a behavior I also find confusing). I just uploaded a patch on the Gnome bugreport which fixes the bug! Jean-Louis, can you please attend to your patch upstream? Cosimo has given some feedback. I've created a patch in the upstream bug with fixes for the feedback. Can someone please review it? Marking as Triaged against the upstream bug with patch attached. @black: I have tested your patch. Everything works fine, even the scenario mentioned in the feedback. But there is a little blemish when toggling between search field and navigation window. 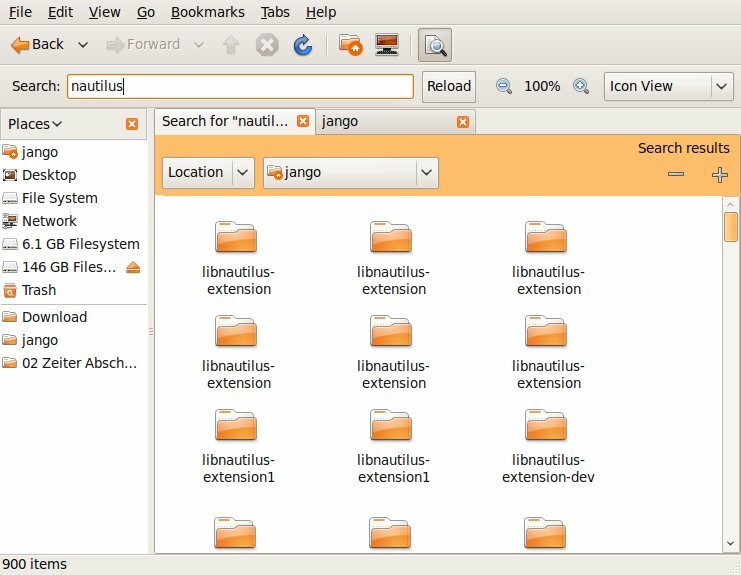 The search window is some pixels smaller, so the content of the whole nautilus-window jumps up and down. This probably is because of the removed toggle between button and text-based location bar in the search window. Is it possible to make both "windows" the same height? It looks really awful. A pic is attached, where you can see, that the search window is some pixels smaller, than the navigation window. When toggle to search window, the sidebar, and the folder content icons jump up and down. I think it is because of the removed button, which toggles between text-based and button location bar. This button needs more space than the text-input field. i have just installed the new human-icon-theme version 0.34 which came with updates today (September 1st). There icon for the toggle (between text and button location bar) was made smaller. So the button needy less space. So this issue is fixed with human-theme, but still is present with other themes. Nicely spotted jango. I've updated my patch upstream. thanks black for fixing the issue! I hope the patch is reported soon. Sorry, i found something else: If you already do a search, and you remove the criterion for the location, you can't toggle back to the navigation window! Clicking on the button does nothing! There is another characteristic which is questionable. When changing the location in the criterion bar, clicking onto the search toggle opens this new location as a browser window. It would be logical, if it would bring you back to the folder, where you started the search. The Documents-directory is your working place for some documents - then you need a file there and search for it. You change the location in criterion bar, so that it is detectable, and then you want to toggle back to your previous directory. The location chosen in the criterion isn't important any more, it was only for the search. About the questionable behavior. When you change the location in the search, you deliberately change the location. So I think it should go to that location, not a location in the past. Yea - I personally also can't decide what is the best. Because, if you want back to the previous folder, you can use the back button, too. So maybe it should do something else . When i tried out your new patch, something interesting happened. I started a search, and changed the criterion from location to file type. Then, when clicking the "Reload"-button the whole screen flickers black after one second. Can you confirm this? Found no bug-report about this issue. 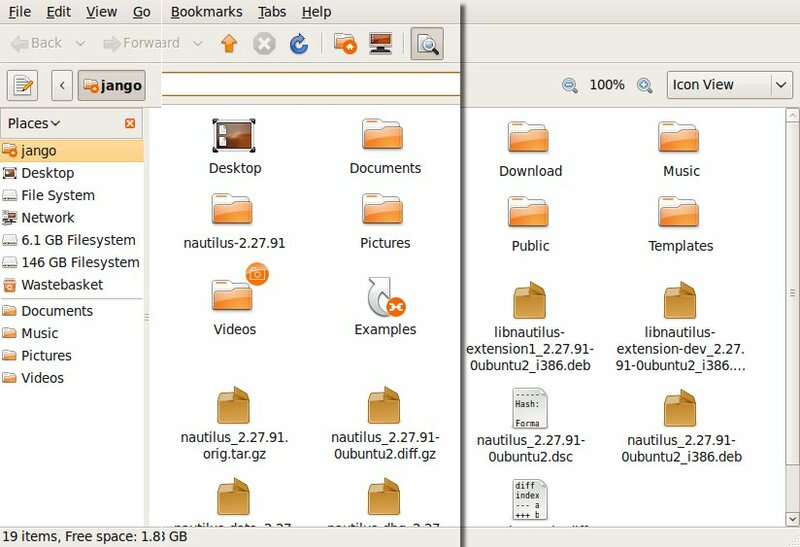 This also happens in nautilus-2.27.91-0ubuntu3, so it has nothing to do with the patch. and put a confirm button next to the textbox to execute the search." What do you think about a "Go"-Button? There would be enough space for it. There are people in the world, who make everything with their mouse. @jango: Can't confirm your other bug. It looks like it's related with your graphic card. Hope I can make a patch before I go on holiday on next week monday. This flickering is because of a second partition mounted. If this partition is unmounted, it doesn't flicker. For every partition mounted the screen gets black once. I will open a new bug report about this. I am in holidays for 3 month :D, but i am not able to write C yet. wrote my test-result upstream... it is easier so. It is a problem, that the go button does the same as the reload button now. Or he should do, at least. Maybe you can unite them into one? I have written a mail to the mailinglist to discuss the decisions. There is a comment upstram by Alexander. He reviewed the bug and found only two issues with shortcuts... and some comments and spaces missing.